This pattern is available from yarntelier.com for £5.00. 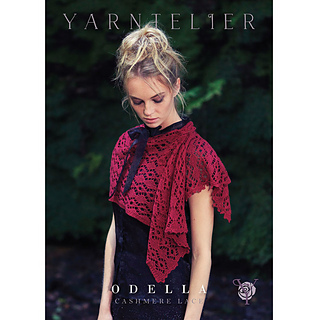 This pattern is designed to be knitted in either Yarntelier Cashmere Lace or Yarntelier Cashmere Gilli. 21.5 sts x 22 rows to 10 cm (4 in) square measured over lace pattern using 5 mm (US 8) needles once wet blocked. 16.5 sts x 18 rows to 10 cm (4 in) square measured over lace pattern using 6 mm (US 10) needles once wet blocked.